Turn projects into success stories and keep them from failure. Dragon1 is an online enterprise collaboration platform and it is fit for Project Management. Any Project Portfolio can be modeled, visualized, designed, analyzed, monitored and managed. On this page we will outline how you as Business Professional can use Dragon1 Innovation lab for Project Management. First of all: What is Project Management? Project Management is a process and the series of activities for planning, organizing, motivating & controlling resources, procedures & protocols to achieve specific goals and objectives in scientific or everyday problems. That said, people can definitely use a tool for Project Management controlling the resources and planning much better. Dragon1 offers you the possibility to create products from scratch without any help. But you can also choose to edit a pre-filled template and work from a checklist. For instance the following products are often created by project managers: Project Architecture Landscape Map, Project Planning (GANTT Chart), Work Breakdown Structure and Project Team Organization Chart. For every product a checklist and a prefilled, re-usable and editable template is present. Watch examples of the templates here. Further on this page we will show what and how project management products can be created on Dragon1. You can be very productive with project management. You can just follow the steps in the checklist and make sure your IT project does not fail. The success of a project depends significantly on the availability and alignement of milestone products. This checklist focusses on having certain milestones available and aligned in the project. Download the Basic and Detailed Auditing Checklists for IT Projects here. Dragon1 defines a new artifact: the Project Landscape Map. A Project Landscape Map is a generic overview of the structure or architecture of the project organization itself. You model and visualize your own Project Landscape Map and use it to report the status and progress of the structure of your project. Read more about the Project Landscape Map Definition here. Enterprise Architecture, Information Architecture and IT Infrastructure / Technical Architecture are fields of science for which it is useful to create insights and overviews of your Project landscape in order to be able to manage them better. You can do Project Management the way you want to do it. You can even manage several project portfolios. Because of this you can scan, compare, link and analyze things across projects. So do some tracking and tracing. For instance, to provide, for example as consultancy organization, data to your customers about how much projects work with a valid and signed off financial business case. You can model and visualize not only the subject or object that is designed and created by the project, but you can also model and visualize the project's structure. This enables you to ask the why & how-to questions and with that to do some rationalization on the projects subject and the project structure itself. Most common, people create an EA repository for their project elements and IT Infrastructure components at a logical, physical and implementation level. It is not only important to know of the structure of your project concepts and IT Infrastructure principles at a logical and physical and implementation level. In relation to your enterprise strategy, it is more than important to know the project concepts and the IT Infrastructure principles at a conceptual level. Even though every project subject or object and project structure is unique, some generic patterns can be identified in the subject, object and project. By doing that people will get more productive. Dragon1 provides you with the capability to analyze and design solutions using patterns and also make use of your user-defined patterns. A lot of anti-patterns always maintain situations you don't want to. You can work with anti-patterns to get rid of them. Visual Project Management Tools (PM Tools) like Dragon1 help to do Project Management at a high level. You can create products like a GANTT Chart, a Work breakdown structure, a Product breakdown structure. 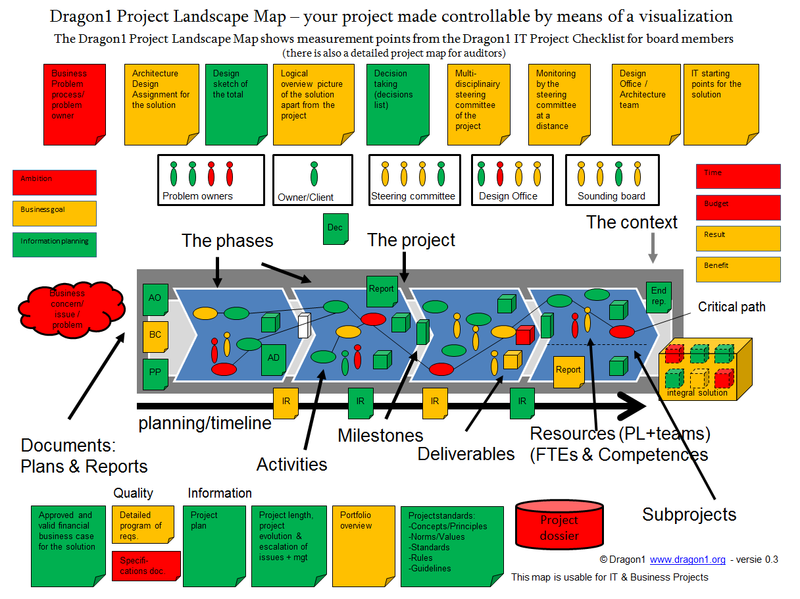 You can create a Project Landscape Map to design the best Project Architecture. And you can manage your project using a Project Management Dashboard.